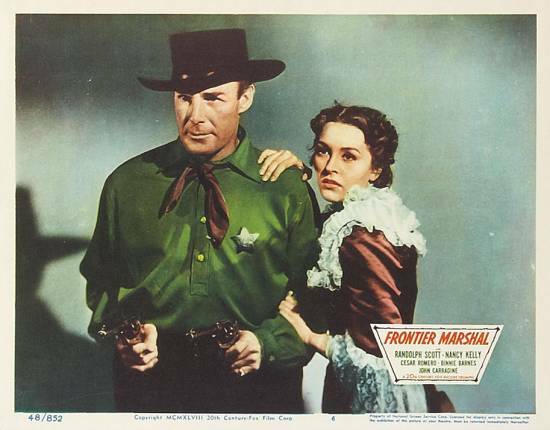 With all the wildly inaccurate films about the life and times and Wyatt Earp (in other words, all of them), I figured that one purportedly based on the book Frontier Marshal by Stuart Lake (based on conversations with Wyatt himself) would be closer to the mark. 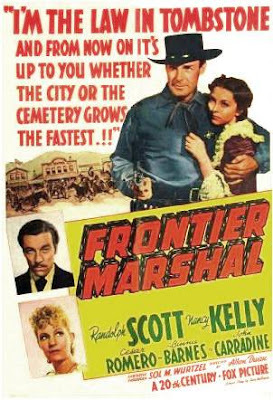 Frontier Marshal is, in fact, the most historically silly Earp film I've seen, and I've seen a lot of them. So I have to warn you. In picking this turkey apart, I can't help unloading a few SPOILERS. If you're allergic to those, this might be a good time to bop over to BEAT to a PULP and check out Richard Prosch's new weird western, "Blood Kin." That's HERE. First, the good news. 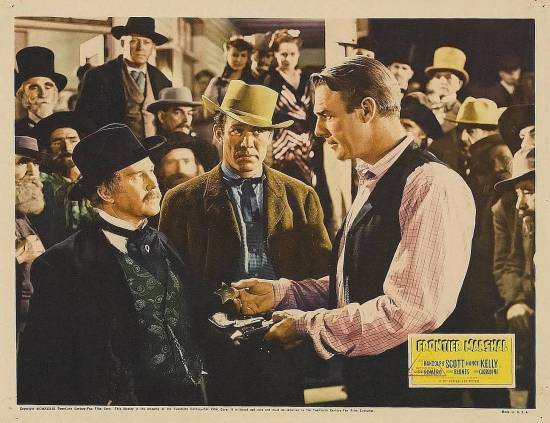 Randolph Scott, as always, is playing Randolph Scott, but his Earp is as good as anyone's. Cesar Romero makes a fine Doc Holliday. 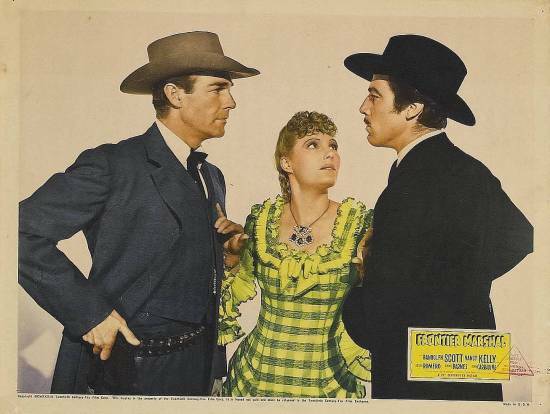 And the supporting cast includes John Carradine, Lon Chaney Jr. and Ward Bond. We even get Eddie Foy Jr. playing the role of his father. 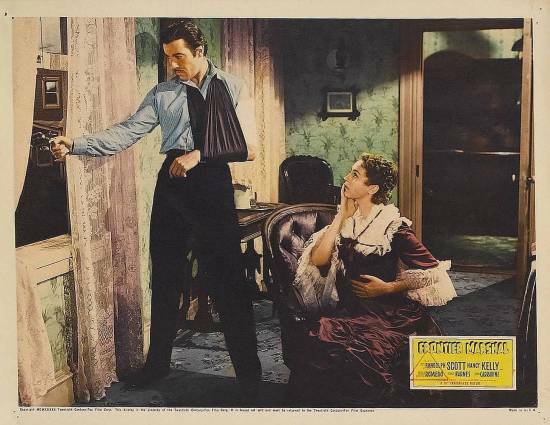 There's one great scene, where Wyatt trees Indian Charley and drags him into the street by the heels (see lobby cards below) and a couple of other decent (but too brief) action scenes. Now the bad news. This film is only marginally about Wyatt Earp. The real story revolves around Doc Holliday's completely fictional love life. Doc, so the story goes, abandoned his good girl fiance because he didn't want to saddle her with a lunger. In Tombstone, he dallies with the bad girl saloon dancer, who naturally falls for him, and resents it (as does Doc) when Good Girl finally tracks him down. The rest of the film is mostly about Wyatt trying to help Doc choose Good Girl. Ho hum. Then there's the slap in the face of history. Remember what I said about SPOILERS? Here they come. There's some silly talk early on about Doc's medical practice back in Virginia, and him birthing a lot of babies (Doc, of course, was actually a dentist). The reason for this tomfoolery becomes clear when the saloon keeper's kid is shot, and Doc is called upon to perform emergency surgery (Yeah, I know - an emergency root canal would've had less emotional impact). Throughout the film, Wyatt has a hate-hate relationship going with Curly Bill. That, of course, is as it should be. But after Doc's love triangle finally works itself out (guess who he choses? ), Curly Bill rides into town and shoots Doc dead. 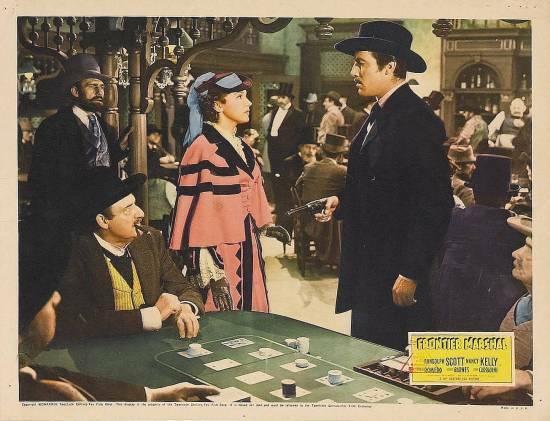 Bill then tells Wyatt he and his gang will await him at the OK Corral. So Wyatt marches off to the shootout alone, without his brothers (who are absent from the film) and without Doc (who dies six years before his time). 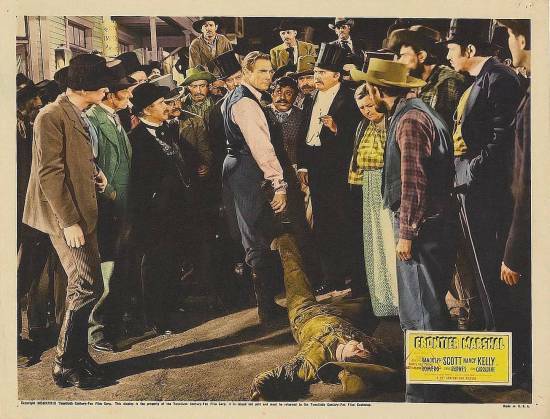 At the corral, which in this case appears to be more of a livery stable (a far cry from the vacant lot next to Fly's Photography Studio), Wyatt battles Curly Bill and his boys, including Indian Charley, who appears to have risen from the dead - instead of Billy Clanton and the McLaury brothers (also not in the film). And it takes place at night instead of the afternoon. And when Curly Bill runs away, he's shot down in the center of town by Bad Girl, who thereby redeems herself and gets vengeance for Doc at the same time. 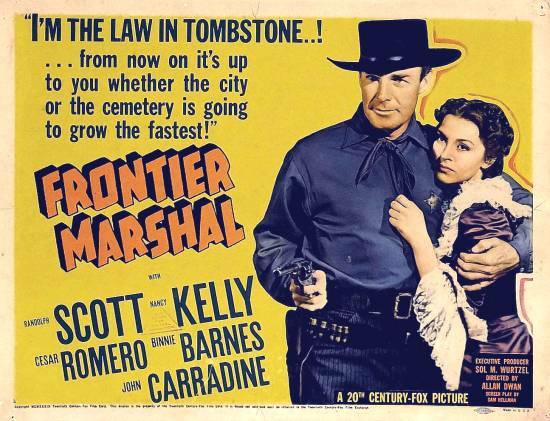 The film ends with the camera zooming on Boot Hill, where a new tombstone reads, John Halliday (sic) M.D. (should be D.D.S. ), 1848-1880 (should be 1851-1887), Beloved and Respected Citizen of Tombstone (should read Hated and Feared Interloper). 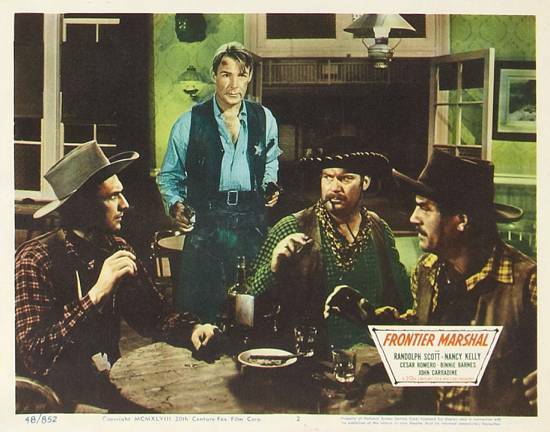 When Ward Bond (center) wimps out as marshal, Wyatt steps in to handle an emergency. The emergency is Indian Charley, who's shooting up the Bella Union. Until Wyatt shoots him. Wyatt drags Charley into the street. Looks mighty dead, don't he? Wyatt braces Curly Bill (seated center) and the boys. New marshal Wyatt catches Bad Girl helping a card cheat and dumps her in the horse trough. Doc arrives in town. This is a staged photo, not in the film. Bad Girl tries to pit Doc and Wyatt against against each, not keep them apart. And Wyatt never wears a suit. After chasing Doc all over the West, his ex arrives. Another staged photo, but a good look at Good Girl. When Curly Bill's gang comes hoorahing the town, Doc saves Wyatt from a backshooter. 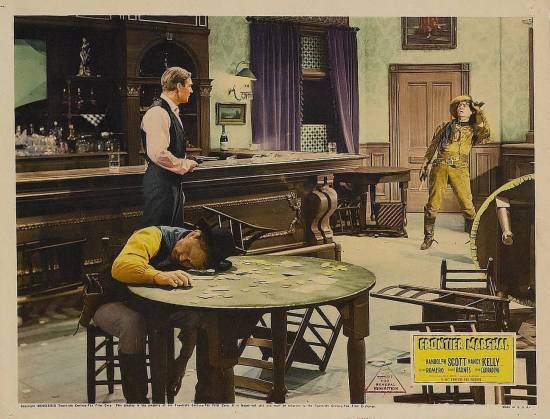 Sadly, there are no lobby cards depicting Doc's demise or the debacle at the OK Corral. Overlooked Films is a SWEET FREEDOM presentation. When even the legend gets in the way of a good triangle for the presumed interests of the female audience, ignore the legend. Sounds like a pre-make of MY DARLING CLEMENTINE, only in the latter film, Doc lives long enough to die at the OK Corral. 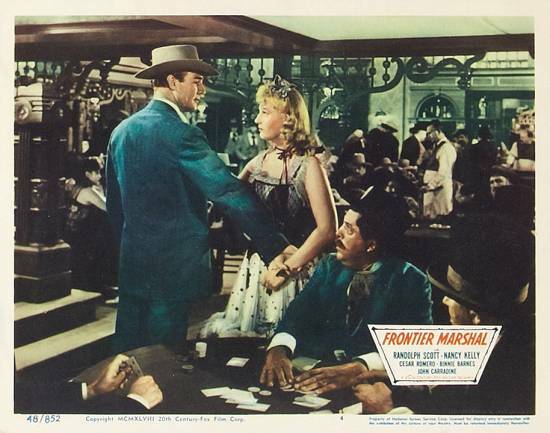 Randolph Scott probably didn't need any practice on his lines for this one. Many decades ago I saw John Carradine on a talk show. He was talking about this movie. He wanted to play the part of Doc Holliday, but the geniuses in charge gave the part of Cheeser Romero. Carradine was flabberghasted. "Cesar is a strapping, healthy man and I am the very picture of incipient tuberculosis," he said. "...gave the part TO Cheeser..." I meant to type. "My Darling Clementine" was basically a remake of this film. It was not historically accurate, either, but at least it did include Virgil and Morgan Earp. Victor Mature was even more of a "strapping, healthy man" than Cesar Romero and did not look sickly enough to be dying of TB. But then, neither did Kirk Douglas or Peter Breck.